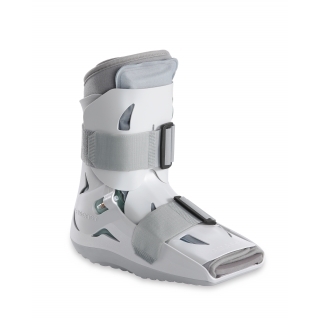 Aircast Walker Boot (Short Pneumatic),Perfect in healing ankle injuries and fractures.Low profile design for an easy fit. Perfect in healing ankle injuries and fractures.Low profile design for an easy fit. Aircast SP Walker by DJO Canada is perfect for those where limb length prohibits them from using a standard height walker. Features semi-rigid shell protection providing comfort to the users. Cushion like aircells gives extra support to ankles. Perfect in healing ankle injuries and fractures. Low profile design for an easy fit. Available in five sizes; Pediatric, Small, Medium, Large and X-Large. This is the best walker I have ever used. After using many walkers, I felt Aircast walkers are the best. Proud to be the buyer of Aircast walker. Aircast Walker was recommended by my doctor after I had a fracture. It was so expensive but I needed it soon. I was helped online by a gentleman and with an extra charge of 15$ my product was delivered to Alberta in one business day. I am very satisfied with the features of the product. It is very comfortable, useful and it healed my ankle injury. This is exactly what I was looking for. Its great. Very comfortable,light weight and easy to wear. It solved my foot issues. It minimized the pain and allowed the foot to heal. I am quite satisfied with this walking boot. It is a great boot. Solved my foot issues. Its a well designed and quality product. Very helpful, comfortable, lightweight and easy to wear. Moreover it keeps my foot stable which makes it possible to walk without pain. It did the job and I would highly recommend this boot. My physician recommended this walker to me as I had an ankle injury. I must say nothing could be better than this. It keeps the foot stable so that I can walk without pain. It is so comfortable,light weight weight and easy to handle. I fractured my ankle so got this boot from my physio therapist. It is lightweight, comfortable, easy to wear and great fit. The boot is fantastic and perfect for walking. Definitely recommend to others. I am wearing this boot from last 4 weeks and it supports so well. I am short heighted and this boot is perfect for me. It works better than the taller boot. So comfortable and light weight . Easy to put on/take off. Highly recommended. is easy and simple to place the order. I liked the prices and beautifully described products. for the product to arrive.